Dog books continue to be more and more in demand, and travel books are one of my favorite things, especially in the winter. The cover on this is great, too! 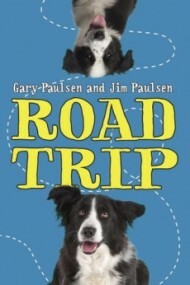 I tend not to think of Gary Paulsen as a humor writer, but that is quickly changing. The last several books by this mainstay in children's literature have been hysterically funny and just what my middle grade readers are wanting. Road Trip is another great book, and it was fun to see Mr. Paulsen's son joining him on the writing, especially in a book about a father and son.